QCMAGIC: Quartz Crystal Microbalance - Biofotonica S.r.l. The QCMagic modular set-up belongs to the Quartz Crystal Microbalance-based (QCM) instruments. It is manufactured by an Italian Company: Elbatech SRL. QCM consists of a thin quartz disk with electrodes plated on it: it is a shear mode device in which the acoustic wave propagates in a direction perpendicular to the crystal surface. The minimum impedance occurs when the thickness of the crystal is a multiple of a half wavelength of the acoustic wave; the resonant oscillation is achieved by including the crystal into an oscillation circuit where the electric and mechanical oscillations are near to the fundamental frequency of the crystal. QCM consists of a thin quartz disk with electrodes plated on it: it is a shear mode device in which the acoustic wave propagates in a direction perpendicular to the crystal surface. The minimum impedance occurs when the thickness of the crystal is a multiple of a half wavelength of the acoustic wave; the resonant oscillation is achieved by including the crystal into an oscillation circuit where the electric and mechanical oscillations are near to the fundamental frequency of the crystal. ?q and ?q are the density and the viscosity of the quartz, n is the overtone number, f0 is the basic oscillator frequency of the quartz and m is the mass adsorbed on the surface per unit/area. 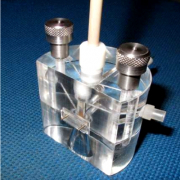 to operate with up to 4 independent quartz crystals (or with two pairs of working/reference crystals). 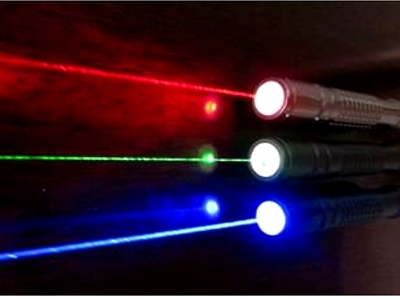 QCMagic can be equipped with low-volume static or flow-through reaction chambers, which house the oscillating crystal; fitting the transducer into the different type of cells is rapid and convenient. QCMagic makes use of a precision internal reference crystal, used as a timebase comparator. Depending on the frequency of this internal timebase, each Unit can be tuned to work with a specific working crystal, choosen between 1 and 10 MHz. The Oscillator Modules are connected to the Base Unit by means of a RJ45 cable carrying both power supply and signals. Silanized Quartz covered by BSA (Bovine Serum Albumine) and the contact solution contains specific BSA antibodies (1 mg/ml). The same quartz has been set in contact with a solution withount specific antibodies. Association dissociation and affinity costants studies. 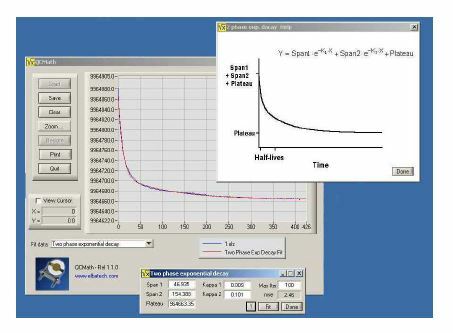 It is possible to mathematically model the frequancy variation curves and calculate the bounding kinetic costants between a specy covered on quartz and another in a flowing solution. Si può modellare matematicamente l’andamento delle curve di variazione della frequenza nel tempo e ricavare le costanti cinetiche di legame tra una specie adesa su un quarzo ed una fatta fluire in soluzione. Variation assay of different density and viscosity solutions. Frequancy variation of quartz Mistral n° 15 in contact with different liquids. 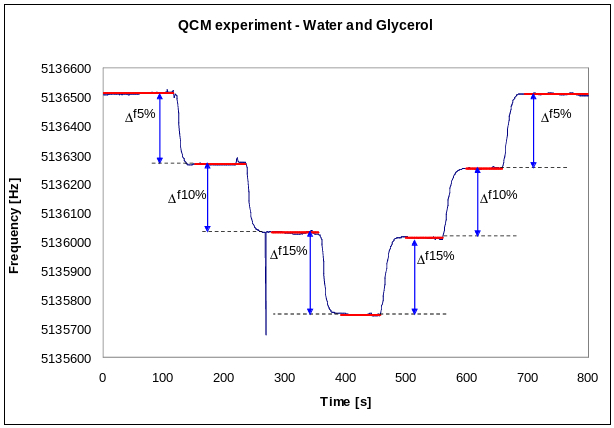 Frequancy variation of quartz Mistral n° 15 in contact with water and sucrose at various concentrations. 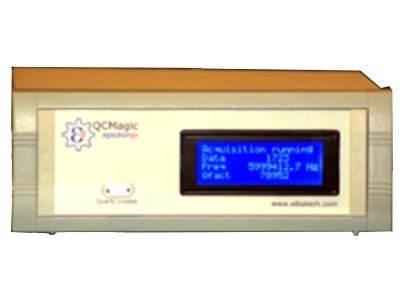 QCMagic is interfaced with a personal computer by USB port for data acquisition and storage. The system is driven by an extremely user-friendly software running under MS-WindowsTM. It consists of a lower level kernel which implements the necessary data transfer between the computer and the unit(s), and of a high level set of routines which drive the user through an easy to perform data acquisition and analysis. 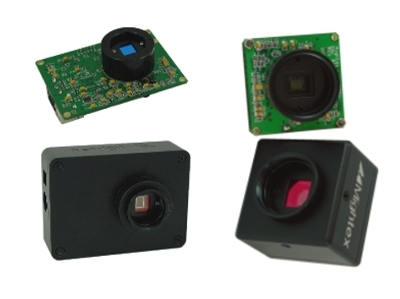 In addition to the data acquisition service routine, an useful data display has been implemented by which the user can easily retrieve the acquired signal levels. Oscillating frequency versus time measurements can be performed following the data acqusition in real time on the computer screen, by means of strip chart plotting. 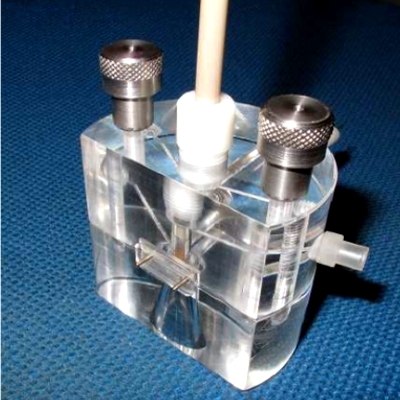 QCMagic can be equipped with low-volume static or flow-through reaction chambers, which house the oscillating crystal. Hand-made by our specialized mechanical technicians, they are usually built in plexiglass, teflon or stainless steel, depending on the application and on the chemicals in contact with them. Our standard measuring cells feature both static and flow-through operation (just flipping upside-down the chamber), being indeed very compact. Mounting the transducer into the cell is quick and easy thanks to a precise fitting of the crystal. Our chambers utilize standard quartz cases and can be used with any commercial crystal, not necessarily bought from us. Our precision Potentiostat-QCMagic setup can exploit its best in conjunction with our dedicated EQCM measuring chamber. The cell houses the oscillating crystal in a precise fitting and can be realized in plexiglass, teflon or other materials, depending on the application and on the chemistry in use. Both the Reference electrode and the Platinum Counter Electrode are very close to the crystal in order to lower the overall impedances. Flow-through operation is guaranteed bubble-free after electrode placing, with minimized inlet and outlet paths. Assembly of the chamber is very easy, practical and safe. 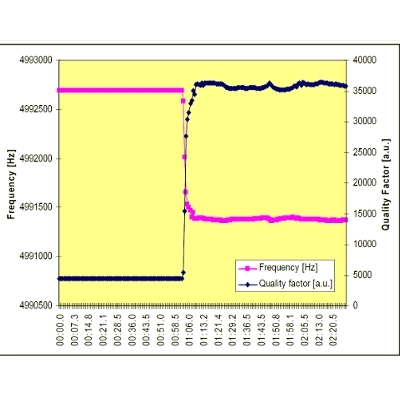 Example of frequncy and quality factor measured with the QCMagic. 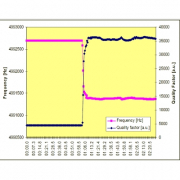 Measurement of the quartz crystals Quality Factor was proven to give key information about many experimental quantities and parameters that frequency measurements alone cannot provide. By a feedback-based circuitry, our device can track the Quality Factor together with Frequency, while sustaining the oscillation even in demanding damping conditions, at an acquisition rate fast enough to follow the dynamics of many biological, chemical and electrochemical events. Our USB-interfaced base unit can be either equipped with standard oscillators or with the novel f-Q measuring endpoint, thus offering the maximum flexibility with minimal economical effort.